People seem to like beach photos, so I will show one more beach photo before moving on to another subject. Walking along the beach or listening to the waves and breathing the ocean breezes can make one tired, I guess, so why not grab a book or a magazine and relax and perhaps have a little snooze under a shade tree along the beach? These lounge chairs are part of the grounds of the Capitan Suizo Resort, which is at southern part of Tamarindo beach. It is about halfway between our condo on Langosta Beach and our condo at the Diria Resort in the middle of Tamarindo Beach. We obviously walk past this area frequently, but resist the temptation to relax in the lounge chairs, as they are, of course, reserved for guests at the Capitan Suizo. We do enjoy stopping in for dinner at the Capitan Suizo restaurant, which is right beside the beach. High tide and high seas combine for the fury of this wave on Langosta Beach. This is a contrast to the peaceful scene of the photos posted during the last two days. During high tide, there are one or two points where walking along Langosta Beach makes it wise to time the walk around some of trees to coincide with the time when waves have receded into the ocean, or to walk on the inland rather than the ocean side of the bushes and trees on the beach. We are featuring photos of India this week on our Viva la Voyage travel photo site. This is high tide on Langosta Beach, in contrast to yesterday's photo at low tide. I seem to have fallen in to doing a little series of beach photos to illustrate the variety of waves and tides on Tamarindo beach and Langosta beach. I hope readers are not tiring of the beach photos. I think I will post one more tomorrow to show a day with very high tides and strong seas. On our Viva la Voyage travel photo site this week we are showing photos that feature the people of India. This is a photo of low tide at Langosta Beach. Yesterday I showed low tide at Tamarindo Beach, so today I am showing the beach around San Francisco point from the scene that I showed in yesterday's photo. The building that you see peeking ave the trees along the beach is our condo. You can see why we like to walk along the stretch of beach near our condo. It is a beautiful beach and is not crowded. Langosta is a quiet residential area a short walk from the main part of Tamarindo beach. Today is Sunday, so we have posted new photos on our Viva la Voyage travel photo site. This week we are showing some photos of India, including some photos that show the charm and beauty of the people of India. Yesterday I showed the main part of Tamarindo beach at low tide. Here is low tide on the southern end of Tamarindo beach, with San Francisco point in the distance. Around the point is Langosta Beach. In this series of beach photos, I have mentioned that Tamarindo beach is gently sloping. You can certainly see that in this photo. The beach is so gently sloping that you can even see a few reflections of the clouds in the water that has not yet receded with the departing wave. This week on our Viva la Voyage travel photo site we are showing photos of Australia's Uluru, or Ayers Rock. Two days ago I showed the main part of Tamarindo beach at high tide, and here it is at low tide. You can see how much wider and how gently sloping the beach is. This photo was taken in the very late afternoon. The clouds in the distance are catching the rays of the sun and the beach is starting to take on a golden hue. For a late afternoon photo of Uluru (Ayers Rock) and other photos from the Australian Outback, check out our photos this week on Viva la Voyage. Yesterday's photo showed a lifeguard's kayak, and Brattcat of Brattleboro, Vermont Daily Photo left a comment asking a question about whether the water is safe or dangerous. Here is my answer, and I apologize for its length, but I wanted to be thorough. As you see in this photo, swimmers in Tamarindo have the ability to choose whether they want large or small waves. There is an island and a reef at the southern end of the bay that shelters the waters and makes the waves small. That is why there are boats moored in the southern part of the bay, which is shown in this photo. The boats and swimmers are protected from the ocean waves. At the northern part of the beach, the ocean waves roll in. That area is popular with surfers. Just beyond Tamarindo beach is Tamarindo estuary, which I have shown in the past, and across the estuary is Playa Grande, where the leatherback turtles nest. When the tide is going out, swimmers should not go into the mouth of the estuary north of Tamarindo beach because the tidal current flows out of the estuary into the ocean. Tragically, a swimmer disappeared in Tamarindo 6 months ago. He was a British journalist who left his hotel by himself on his first morning in Tamarindo in his swim suit to go to the beach, and was never seen again. His wallet and valuables were in his hotel room and people think that he drowned in the ocean. A large search effort was mounted and his friends and relatives have quite understandably generated a lot of publicity to see if anyone saw him before he disappeared. I don't know why, but the news media or others sometimes will exaggerate or distort reports involving the safety of foreigners in developing countries. After the disappearance of the British tourist in Tamarindo, there have been news articles and internet postings about the disappearance of foreigners in Tamarindo. Besides the British swimmer, the articles talk about a hiker who disappeared in Rincon de la Vieja National Park, which is 90 minutes away from Tamarindo, and another tourist who was lost at a small beach town hours south of Tamarindo. These other incidents, although tragic, have nothing to do with Tamarindo, but now even the Wikipedia entry for Tamarindo has a large heading and prominent discussion about the alleged disappearances of tourists in Tamarindo. This is about as accurate as saying, for example, that Monterey, California is unsafe for tourists because a hiker disappeared in Yosemite and another tourist disappeared in San Francisco, or that Palm Beach is unsafe because someone was lost in the Everglades and another person was lost in the Florida Keys. For Europeans, it would be like saying Nice, France is unsafe because someone disappeared in Marseilles and a hiker was lost in Grenoble. 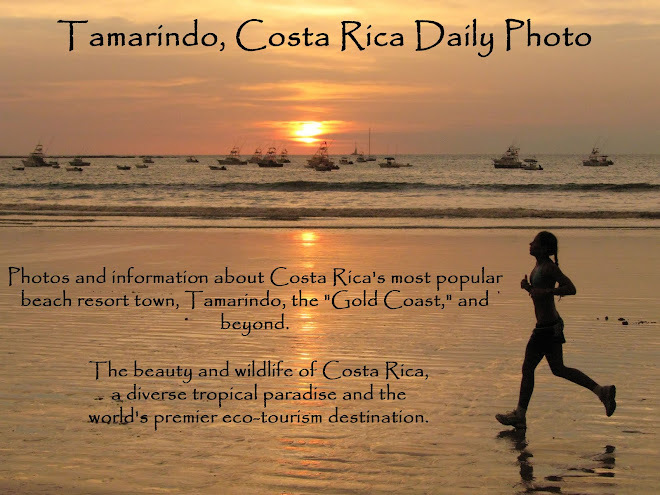 I have always felt very safe in Tamarindo, both in the water, on walk along the beach or in the forests, or in town. My wife has gone to Tamarindo with our friend, Sharon (of Phoenix Daily Photo) by themselves and they felt perfectly safe walking back to Langosta after dinner at night, and doing a full range of activities. This week on Viva la Voyage we are showing photos of Uluru, or Ayers Rock, in Australia. This is the center of Tamarindo Beach. Behind the palm trees is the Tamarindo Diria Resort. The beach lounge chairs are set out by the resort for the use of hotel guests and residents and guests in the condos that are part of the resort. We have a condo at the Diria Resort, so we enjoy the amenities of the resort. Notice that there is a lifeguard kayak in the foreground. The hotels in Tamarindo contribute money to pay for lifeguards to help provide safety for swimmers. That is an important public service because the town government for Tamarindo is located in Santa Cruz, about one-half hour inland. The local community is much more interested in having lifeguards than is the government inland. This week on our Viva la Voyage travel photo site we are showing photos of Uluru, also known as Ayers ROck, in the Australian Outback. If you look closely, you will be able to see that this white faced Capuchin monkey is reaching for a banana that we tossed to him. These monkeys are very intelligent. They are the same species that organ grinders will use to solicit donations from a crowd. I read an article in the local newspaper recently that in our region of Costa Rica environmental authorities have installed several hundred "monkey bridges." Wildlife authorities studied monkey behavior to determine the places where they travel most frequently. They built the monkey bridges across roadways and in areas that monkeys have been traveling across telephone and electrical wires. The purpose is to give monkeys safe passage to reduce accidents. We have a monkey bridge right in Tamarindo in front of the Capital Suizo Resort. It provides a way for monkeys to cross the road from Tamarindo to Langosta from the safety of about 15 meters above the roadway so they do not have to deal with traffic on the street. The monkeys are more comfortable and safe traveling around from tree to tree rather than down on the ground. On our Viva la Voyage travel photo site this week we are showing photos of Uluru, also called Ayers Rock, in Australia. After my story about a daring rescue of a baby whale off the coast, I am posting this photo of a sea turtle lounging in the ocean off shore from Tamarindo. Sea turtles nest all along the beaches near Tamarindo. This appears to me to be an olive ridley sea turtle, which are common in our area. The are the smallest of the sea turtles, although they can weigh 200 lbs. (45 kg.) and can be 2.5 ft. (70 cm.) long. They average 50 years in the wild. They do not get a much attention as the very endangered leatherback tortoises. The leatherbacks nest on Playa Grande, which is the northern half of Tamarindo Bay. We have a nice view of Playa Grande from our condo at the Tamarindo Diria Resort. The beach at Playa Grande and the waters off Tamarindo are protected as part of the the Las Baulas De Guanacaste National Marine Park. A major point of controversy is the issue of preserving the beach for the leatherback turtle nesting site on Playa Grande, as lights from houses or guest houses in the area can confuse or bother the turtles. During the winter months National Park rangers lead small groups out onto the beach at night to quietly, and in the dark, wait to observe the turtles coming ashore to lay their eggs. On our Viva la Voyage travel photo site this week we are featuring photos of Uluru, which is also known as Ayers Rock, in the Australian Outback. Yesterday I began the story about a fishing boat that found a baby whale with a fishing net wrapped around its head. The fishing boat summoned help by cell phone and marine radio and many others gathered near the baby whale in distress and the two parent whales. One of the dive boats that came to help pulled along side the baby whale and two crew members jumped from the ocean and grabbed onto the net that was being dragged by the baby whale. The frightened whale continued swimming and struggling and dove. One of the men had his mask knocked off and was no longer able to help. The second man hung on to the end of the 40 meters of net that was being dragged through the water behind the baby whale. This man managed to pull himself forward to reach the whale while he was being dragged through the ocean. With a knife, he cut the net to free the whale. The baby and two parent whales then swam out to sea, and all of the people on the boats that gathered around the scene applauded the skill and bravery of the men who freed the whale. Congratulations and praise for all involved is certainly well deserved. The full story can be found at this link to the Guanacaste Jounal article about this amazing rescue. I am using one of my dolphin photos to illustrate this story. Some guests who have stayed in our condo have said that they have seen whales swim by from our balcony. Today is Sunday, so on our Viva la Voyage travel photo site we have posted new photos. This week we are showing photos of Uluru, formerly known as Ayers Rock, in the Australian Outback. The local newspaper recently carried a story about a remarkable rescue of a baby whale. Since I finished my series on Julie's "rescue" by a lifeguard with a kayak yesterday, I thought I would tell the story of the baby whale rescue that was in the Guanacaste Journal recently. I don't have a photo of a whale to illustrate the story, so I will use this photo of some jumping dolphins off the coast of Tamarindo, as it is the closest I have to a whale. Recently a fishing boat on a half day charter out of Playa Flamingo, which is about 15 minutes north of Tamarindo came across a group of humpback whales near the Catalina Islands, which are some very small rocky islands just off shore. They are popular spots for snorkeling. A 40 foot humpback whale breached completely out of the water very close to the fishing boat. A full breaching whale is usually a sign of distress. The fishing boat captain then spotted a newborn baby whale tangled in a fishing net wrapped around his head and dragging 40 meters of net and floats behind the whale. The fishermen tried to grab the net to free the whale, but it was hopelessly tangled and struggling. The captain of the fishing boat used his cell phone and marine radio to call for help. Nearby dive boats answer the call and soon there were a group of small boats gathered to try to help, with the baby whale crying and two adult whales circling around in obvious concern. I will conclude this story tomorrow, which I know is rather cruel, so I will at least let you know that there is a happy ending to this story. In the meantime, if you have not yet checked out this week's photos on our Viva la Voyage travel photo site, come take a look at our photos this week showing the Mezquite Cathedral in Cordova, Spain and the Escorial outside Madrid. Julie is happy to be back on the Tamarindo/Langosta side of the Langosta estuary. With a nice tip, the lifeguard is off to kayak back to his lifeguard station and tell his buddies about his rescue of the short-sighted blond American who took a long walk down the beach and forgot about the high tide. Julie has left comments to this series of posts justifying her apparent helplessness that caused the lifeguard to rescue her by saying that she did not want to get her camera wet. I should therefore point out that I swam back across the estuary, and obviously I had my camera with me, as my photos of Julie's rescue prove. I held my camera in a small pack up out of the water with one hand as I swam across, keeping the camera dry above the waves. When I reached the other shore, my son reached out so I could hand him the camera while I climbed out of the water. You can guess what happened next. The camera dropped into the ocean. It was not a waterproof camera, but we grabbed it so fast that the water did not penetrate the pack, and the camera was fine, as these photos attest. Having finished this "rescue" series, tomorrow I will tell a story that was in the newspaper recently about a rescue at sea near Tamarindo that is absolutely remarkable. On our Viva la Voyage travel photo site this week, we are showing photos of the Mezquita Cathedral in Cordova, Spain and the Escorial outside Madrid. Fortunately, Julie had some money inside her back pack when we took our long hike along the beach so she was able to give a nice tip to the lifeguard who paddled across the mouth of the estuary to pick her up and bring her back across to the side of Langosta where our condo is located. Julie is a conscientious and generous tipper. I am sure that she was as relieved that she had her wallet with her as she was that she was able to attract the attention of the lifeguard. I will conclude this little series tomorrow. On our Viva la Voyage travel photo site we are showing photos from Spain this week. Here is a photo of the kindly lifeguard paddling the kayak to bring my wife across the Langosta estuary. I mentioned during the last few days that my wife getting picked up by this lifeguard in a kayak is an example of what my son will describe as "playing the blonde card." Another example occurred occurred a month or so ago. Julie was pulled over by a policeman for driving a little too fast in Scottsdale, Arizona. She told the officer that she did not notice her speed because she was distracted because she was admiring the pretty blue sky. Although in Arizona we have blue skies 89% of the daylight hours, the officer let her go without giving her a ticket. Julie contends that being a blonde had nothing to do with the policeman letting her go and that she has been pulled over by police more often because of her blondness, but my son and I are not buying that contention for a minute. Tomorrow I will show Julie thanking the lifeguard for his efforts in rescuing her. I mentioned yesterday that Julie is a type-A personality, and she shows that trait here. This lifeguard was kind enough to rescue her from a situation in which he would have been fully justified in thinking that she was foolish and lacked foresight. Yet as soon as she got into his kayak, she somehow thought she needed to point out where she wanted him to take her. He paddled across the estuary to pick her up, and he was obviously fully capable of knowing that he should bring her right back across the estuary mouth to the other side. Duh. If Julie told him, "Please take me to the other shore over there," do you think he might have been tempted to reply, "Gee, ma'am, I had planned to take you to 5th Avenue and Central Park South." I am sure he was very polite however, as Costa Ricans treat tourists and visitors very well. I will continue with more of this story tomorrow. If you have not yet checked out the photos of Spain this week on our travel photo site, Viva la Voyage, please come take a look. Julie was "rescued" from the other side of the estuary by this very helpful man, who you see in this photo shoving off to take Julie back across the estuary. How did Julie find a kayak and man to take her back? On the side of the estuary mouth near where our condo is located is the Barcelo Resort, and this man is one of the lifeguards of the resort. He saw Julie standing on the other side of the estuary by herself, not wanting to swim or wade back across. So he got into one of the nearby kayaks and paddled across to pick her up. Julie is a very self-confident, type-A personality professional, but she is not above taking advantage of being a 6-foot (1.83 meters) tall blonde and accepting the assistance of kind people in situations such as this. After Julie got in the kayak, what do you think she did next? Answer tomorrow. Please check out our travel photo site, Viva la Voyage. We have posted photos of Spain this week. Yesterday I showed my wife on the other side of the Langosta estuary, unwilling to swim or wade back across. This is a wide angle shot that makes the estuary appear wider than it is. Yesterday Brattcat left a comment guessing that Julie used her initiative to find another way back. She based that guess on Julie being an independent and resourceful person, as Julie has demonstrated herself to be through her posts from slot canyons and other places on her Scottsdale Daily Photo site. Susie of Arabia guessed that Julie was rescued. Susie was right. As my son would say, Julie "played the blonde card." Julie obtained a ride across the estuary in a kayak. I realize that even if you click on this photo to enlarge it, the kayak rescue is barely visible. I wanted to show the overall scene first, and tomorrow will show a closer view taken through a telephoto, and explain how she found a kayak in which to ride. Today is Sunday, so we have new photos on our Viva la Voyage travel photo site. This week we are showing pictures of Spain. We hope you find them of interest. Upon our return from a long walk down Langosta Beach, my son and I crossed the mouth of the Langosta Estuary, as I showed yesterday. At low tide, we could wade across about waist high, but on the return trip at a very high tide the water was up to our necks at the center of the channel and we had to swim across that part of it (with me holding my good camera up out of the water). My wife, however, did not want to wade and swim across as we did. Here you see the photo I took with her on the other side of the estuary. How do you think Julie made it across? Do you think that she waited for low tide to return? Did she swim across the mouth of the estuary? Did she swim out into the ocean and then swim back to the beach on the other side of the estuary mouth? Did she have me drive around and pick her up, which would take about a half hour? Did she have me come back and carry her piggy back across the estuary? What would you have done? As regular readers of this blog know, I sometimes like to tease you by leaving you hanging. I will show the answer tomorrow. On our Viva la Voyage travel photo site, we are showing pictures this week of Portugal. Today I will continue this little series on our hike down Langosta Beach. This photo illustrates a lack of foresight on the part of me and my family. We paid no attention to the tide. during our walk. These photos are from a couple of years ago, during one of our first walks south of our condo, across the mouth of the Langosta Estuary, and then we took an exceptionally long walk down the beach. It was easy to wade in the ocean across the mouth of the estuary when we started the hike. On our way back, however, the tide was much higher and the mouth of the estuary was much wider. This photo shows one of my sons wading out to cross the mouth of the estuary. My wife, however, did not want to do so. She found a different way to make it back. I will show you what she did tomorrow and the days that follow. On our Viva la Voyage travel photo site this week we are showing photos of Portugal. Today is a special theme day for the Daily Photo bloggers around the world. This is the 5th anniversary since Eric Tenin started Paris Daily Photo, which led to hundreds of others, including myself, first admiring his work, and then starting other Daily Photo sites in our communities. Because imitation is a sincere form of flattery, our tribute to Eric today is to post a photo the imitates the techniques that he often uses, which include ground level perspectives and tilted angles. Here is a ground level, tilted shot of a leaf cutter any carrying a leaf across the parking lot of our condo building. I am sure that Eric has not had the opportunity to photograph any leaf cutter ants in Paris, but if he were in Costa Rica, I imagine that this is the type of photo he would take. Leaf cutter ants are remarkable. They carry the leaves back to their underground nests not to eat the leaves, as you might think. They feed the leaves to a fungus, and eat the fungus. They know the type of leaves that the fungus likes and select only those leaves to carry back. I would like to broaden the theme of this tribute to Eric by extending my appreciation and admiration for all of the Daily Photo bloggers and to the people who operate the City Daily Photo site that keeps us linked and coordinated. Tomorrow I will resume the series of our return from our hike down the Playa Langosta beach. This week on our Viva la Voyage travel photo site we are showing photos of Portugal. When started this hike south along Playa Langosta, I mentioned that we waded across the mouth of the Langosta Estuary. We were not paying attention however, and during our long walk the tide had risen quite a lot. As you can see in this photo, there was a lot more water at the mouth of the Langosta Estuary upon our return. We had to cross the mouth of the estuary again to return to our condo. I will show you how we did it in my upcoming posts. My wife chose a different method that I did. This week we are showing photos of Portugal on our Viva la Voyage travel photo site. While walking along the beach, it is easy to be preoccupied with the waves, sand, vegetation and wildlife along the beach and to miss the view of what is flying overhead. Here is a flock of pelicans flying in a classic "V" formation that I saw on the same hike down the beach that I have been showing during the past week. Tomorrow, I will show the first of several photos of a problem that confronted us as we neared the completion of our return. If you have not done so already this week, please come take a look at the photos of Portugal that we are featuring on our Viva la Voyage travel photo site. Here is another view of the Hacienda Pinilla Golf Course. Even if you do not have a good round, how can it be a bad day on the golf course if you get to enjoy the views, breeze and aroma of the ocean? I like to play golf, but I play only once every couple of years. It takes a lot of time, is expensive, and I usually play only when there is a special occasion or when there is a business reason to join others on the golf course. I have not played golf at Hacienda Pinilla. I took these photos when I was on a walk along the beach and I took a detour to get a few shots of the golf course. This week on our Viva la Voyage travel photo site we are showing photos of Portugal, including some of the architecture and ceramic tile of the Lisbon area. If you have not been to Portugal, please take a look. If you have been to Portugal, you should recognize some of the photos. Farther down the beach, but still before the J.W. Marriott Resort, is the Hacienda Pinilla golf course. Several of its holes run right along the ocean. It was in the afternoon that I took this hike, so I apologize that I was shooting into the sun in taking a photo that shows the golf course and the ocean in the background. I will have to go back some time in the morning to photograph the golf course in better light conditions. Today is Sunday, so we have new photos on our travel photo site, Viva la Voyage. This week we are featuring photos of Portugal, including some of the use of ceramic tiles in Portuguese architecture. Here is a bare throated tiger heron on our walk south along Langosta Beach. I much prefer sharing the beach with birds and iguanas than noisy people kicking sand. Fortunately, we have a beach with lots of wildlife and almost no people. On our Viva la Voyage travel photo site this week we are showing sunrise photos of some of the monuments of Washington, D.C. I promised yesterday that I would show a photo that illustrates that we are on a Costa Rican beach, so here is a beach iguana. It is nice to be able to combine a beach walk with wildlife viewing. At times we can see and hear howler monkeys in the trees that light the beach. By the way, this is completely unrelated to the subject of today's post, but U.S. Secretary of State Hillary Clinton is paying a visit to Costa Rica to meet with the incoming President, Laura Chincilla, who was elected last month to be the first female President of Costa Rica. This week on our travel photo site, Viva la Voyage, we are featuring photos of Washington, D.C., taken during the special light of sunrise. We are close to the far point that I showed in yesterday's photo. And, no, I have still not caught up to my wife, who is a dot in the center of this photo. When Julie gets up to speed on a power walk, it can be difficult to catch up if I am taking photos. The reason this beach is so pristine and uncrowded is that it is separated from the main part of Tamarindo and Langosta by the Langosta estuary. It is part of the master-planned 4,500 acre Hacienda Pinilla development. It is a gated area and only residents or guests of the J.W. Marriott or other guest accommodations are allowed to drive into the area on the inland road, but anyone can walk along he beach. All beaches are public property in Costa Rica. There are not very many houses and condos in the development and the area along the beach is not developed. From our condo in Langosta, we can walk north along Langosta Beach, which has some condos and houses but is not crowded, and can walk around the point to the north to the main part of Tamarindo. If we walk south, we can wade into the water and walk across the mouth of the Langosta estuary and reach this undeveloped, pristine beach. In the next few days I will show some scenes along the walk that will remind you that this is, after all, a Costa Rican beach. This is the same stretch of Langosta Beach that I showed yesterday. My wife and I like to walk along this beach. We can walk for miles and not see another person. The person in the distance of this photo is my wife, as Julie did not wait up for me while I was stopping to take photos. Tomorrow I will show a view from farther down the beach and explain why this beach is so uncrowded. This is a stretch of Langosta Beach south of the Langosta Estuary and north of the J.W. Marriott resort that I showed a few days ago. It is a classic, pristine, tropical beach with hardly anyone there. This view is from a boat, of course, but for the next week I will take you on a walk down this beach. This series will feature sights typical of Costa Rica. It will also conclude by showing what happens when you lack planning and foresight for such a walk. Today's worldwide Daily Photo theme is "passageways," so here is a Costa Rican passageway. We do not have alleyways between old stone buildings the way they do in Europe or other old cities. We have walkways through the forests, such as this one in Rincon de la Vieja National Park. This is the path that leads from the densely wooded cloud forest area down to a lower elevation where there are bubbling mud pits and steaming geysers that release geothermal energy. Rincon de la Vieja is a large volcano, not active, about 90 minutes northeast of Tamarindo.